Who says that the Google Plus Hangouts team doesn’t listen to what users are saying? Sure they do. In fact they have made big improvements in one area of Hangouts and it was the topic of a Hot Blog Tips Hangout on Air. 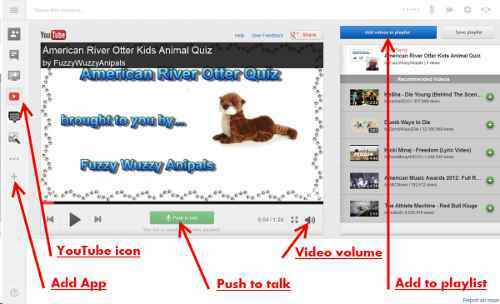 You can now stream YouTube videos while you are in a Google Hangout for the other participants. We talk a little about the new improvements and how you can use the YouTube App in different types of Hangouts. Of course Brian and Mitch have business on their minds, while I tend to go with the family (non business/ funnier) route. If you are thinking about using the new and improved YouTube app in a Hangouts on Air – to0 bad, so sad, you are outta luck! We talked about (in the video above) why HoA’s probably don’t let you show videos on your live show. Now, if you are wondering how you can get the YouTube app in your regular hangout. It is simple as pie (yes, pie is simple; I just have Brad make it). Once you have started your regular Hangout, you will simply look in the Left hand column of your Hangouts window. You will see either a + sign or the text “Add More Apps“. Now click to add an app and you will see YouTube is in the choices. You will have to approve the app to see your YouTube, blah, blah, blah. Just click Accept or OK.
Once you have installed this new YouTube App, you will see an icon in the app bar on the left now. Anytime you want to open to play videos, just click it. Welcome to YouTube in Hangouts! Everyone sees the same video and playlist so adding and skipping videos will affect everyone. Only you see your search queries and results. Have fun and remember that you can share the playlist you’ve created with your friends when you’re done hanging out. So in other words, don’t be playing videos that you don’t want others in the Hangout to see. Sure that pole dancing video was cool, but Grandma or your boss may not be so impressed. In this image I have pointed out a few things to look for when you have your next Hangout. YouTube App Icon. How you start the app in a Hangout. The YouTube Player has a Push to Talk button. This allows a person to push it when a video is playing and it lowers the video volume, release the button and the volume comes back up. If you are watching a music video and want to push that button so we can all hear you sing – DON’T! Video Volume can be set right there in the player! Add to Playlist! You can click that and do a search for any keywords; it will bring up the top 10 listings for that phrase. You can also just grab a YouTube URL for a particular video. See it is easy and kind of cool. Mitch, Brian and I gave some of our ideas of how you could use YouTube videos during a Hangout, how would you use this app? Will you use it for business? Family? Maybe hangin with your friends listening to “hair bands of the 80’s” (it would be cheaper than going out). 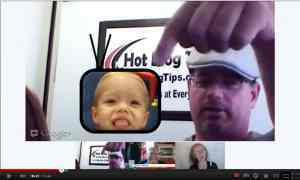 Grab that next Hangouts on Air live show URL and discuss it with your group as it airs? Tell us how you think it can be useful and if you would make more videos knowing you can now easily share them with people in a Hangout.